Greece is a country filled with a magic aroma. They have thousands of years steeped in magical, mystical history. Some of the greatest Immortals come from Greece and their spells are just as powerful. The ancient Grecians held their Immortals in the highest regards and some of the world's greatest spell, incantations, rituals and enchantments are from Greece. There are more than 3,000 ancient Grecian spells in circulation amongst some of the highest Alliances in Greece. Some variations date even before 800 BC. The Immortals have extremely desirable powers and many spend their time dedicated to only one or two Immortals as to Master their powers and gifts. The Greeks have one of the most enigmatic cultures in the world as their powers and persuasion reign even today and no one of us has lived untouched by their influence. Prometheus, son of Iapetus by Clymene, is the Rebel Immortal who was in direct defiance of Zeus. He is the most cunning and completely loyal to humans. He loves humans more than the other Immortals and taught them endlessly in their fight for civilization. By being Prometheus's Keeper you will be rewarded with his cunning, wise and determined nature. You will find that your mind becomes sharp as a tack, your skill, ability to outwit those around you and always end up on top of the world. You will be given all the Immortal gifts of Prometheus and as he loves human Keepers he is more than glad to share his fortunes with you. Prometheus was the only Immortal to stand toe to toe with Zeus and always managed to outwit the supreme Immortal. 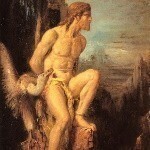 Think of the advantage you will have with Prometheus to guide you... he is the most ingenious of all the Immortals!!! The Immortals are extremely powerful forces of energy... statues carved in their image, tokens worn to bring GOOD LUCK, LOVE, WEALTH, POWER, MONEY, HEALING, CREATIVITY, INTELLIGENCE, PERSUASION, CONTROL, HAPPINESS, SEXUAL SATISFACTION, CLEANSING, WISDOM, GROWTH, BEAUTY, YOUTH, MAGIC ABILITY, VISIONS, FORESIGHT, PSYCHIC POWERS, GLORY, PEACE, AND MORE! They are those who bring the powers of the earth, wind, sky, ocean, fire and elements bound by the creation of all things beautiful. They resonate with energy and the power of eternity. Their glow and warmth of power flows through your body and mind and brings you the treasured gifts of the Immortals. 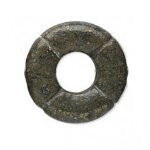 Spell for Wisdom & Wealth Stone Of Power, Prosperity & Success New To Creepy Hollows? Receive A Spell Or Spirit Stone, Connecting Stone, & Charging Pouch For A Penny - For First Time Collectors Only!